(Newser) – Given the choice between noisy hand dryers and tree-felling paper towels, dryers are the better option, right? Maybe not, at least when it comes to your health. 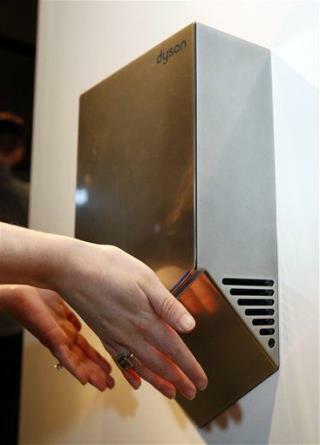 A University of Leeds study finds hand dryers, especially "jet-air" models, can actually spread germs around a public bathroom. To simulate what could linger after poor handwashing, researchers coated participants' hands with a harmless bacteria not typically found in bathrooms. Participants then dried their hands, and scientists tested bacteria in the air near the various hand-drying options. What they found: The air around jet-air dryers held 27 times more bacteria than was found around paper towels, and 4.5 times more than around warm-air dryers. Further, "a similar pattern was seen for bacterial counts [3 feet] away," they write. I don't worry about germs. The more I'm exposed to the stronger my immune system gets.